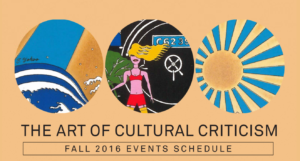 The Townsend Center for the Humanities, the Arts + Design Initiative, the Arts Research Center, and the Art of Writing are pleased to present The Art of Cultural Criticism. This yearlong series of conversations features some of the most innovative and incisive writers on culture in its various forms—including visual art, film, old and new media, music, and literature. Sarah Thornton is a writer and sociologist of culture. Formerly the chief correspondent on contemporary art for the Economist, she is the author of Seven Days in the Art World, 33 Artists in 3 Acts, and Club Cultures: Music, Media and Subcultural Capital. She has contributed to Artforum, the Guardian, and the New Yorker. Terry Castle is Walter A. Haas Professor in the Humanities at Stanford University. Her cultural commentary appears in the London Review of Books, the Atlantic, Slate, the New Republic, and other magazines. She is the author of numerous books including The Professor: A Sentimental Education and The Apparitional Lesbian, and is the editor of The Literature of Lesbianism: A Historical Anthology from Ariosto to Stonewall. Dave Hickey is an art critic and writer for Rolling Stone, Art News, Art in America, Artforum, Harper’s, and Vanity Fair. He is the author of Air Guitar: Essays on Art and Democracy, The Invisible Dragon: Essays on Beauty, and Pirates and Farmers: Essays on Taste.